A fun art project to do with kids on Valentine’s Day or anytime of the year. Pop Art artists of the 1960s, such as Andy Warhol, used everyday objects as inspiration for art. In the 1980s another group of artists inspired by Pop Art followed suit, and the Neo-Pop movement was born. These Pop Art Hearts are inspired by the amazing art of two artists: Jim Dine (Pop Art) and Romero Britto (Neo-Pop). Talk about color and lines. Discuss warm colors (red, yellow, orange) and cool colors (blue, green, purple). Look at artwork by Romero Britto and Jim Dine at the library or online. Using a pencil, draw a large heart in the center of the paper. Paint the center of the heart (striped, blended or solid) using bright colors. Paint the background using different colors so the heart “pops” off the page. If you use warm colors (red, yellow and orange) for the heart, try using cool colors (blue, green, purple) for the background. Let dry slightly. Paint patterns on the heart* or the background (or both). Dots, circles, straight lines, zigzag lines, small flowers—any pattern works. Let dry completely. Outline the heart in black, white (or other bold color) paint. *Tip: To avoid unwanted blending of colors, rinse paintbrushes between colors and blot wet brush on paper towel or sponge. For the brightest colors, do not dilute the paint. Frame your artwork for display. Make small paintings (5”x7” or smaller) and turn them into greeting cards. Scan your artwork image and print to make multiple cards or valentines. 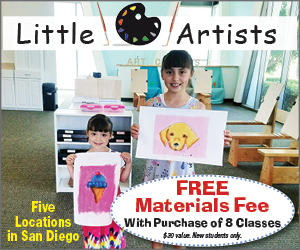 Alyssa Navapanich is an art enthusiast who teaches art to elementary school kids in North County. This cute bunny craft is a perfect springtime or Easter activity for the kids to do at home, school or with friends. You may already have some of these supplies around the house. SuppliesOne short . . . These fancy eggs are great for gifts or extra-special Easter decorations, and kids can make them with just a handful of inexpensive craft items. Supplies: Craft foam sheetBeads, sequins, glit . . . These cute burlap bunnies are fun to create and fill with treats, making them perfect for friends or classmates! Kids can participate in assembling or decorating these treat filled easter decoration . . . Craft some quick, easy and super cute Easter friends with crepe paper rolls!SuppliesSheet of card stock or cereal boxCrepe paper roll(s) in desired color(s)Small scraps of colored paperYarn, buttons . . . Celebrate Earth Day by creating a cute flower picture made from nature items and food coloring.Remember: never pick items from plants; use what’s already fallen on the ground! Looking for . . . Celebrate and promote Earth Day (April 22) with the kids by making posters from recycled newspapers and magazines.Supplies Old newspapers and magazines Red, blue and green watercolors, craft pa . . . Celebrate Earth Day by doing an art project at home and participating in local Earth Day events around San Diego. Discussion Points for Teachers/Parents How to take care of the planet—Reduce, . . .
Not sure what to do with all those old magazines? Get creative and turn the pages into paper bowls or coasters! This is a great project to celebrate Earth Day – or just a fun way to spend a lazy a . . . Surprise friends, classmates or teammates with festive treat bags filled with candy or snack crackers. Perfect for Easter or any springtime celebration! Materials 8½ x 11” cardstock i . . .
Decorate real eggs this Easter to look like sweet treats such as cupcakes, lollipops and wrapped candies. SuppliesEggsEgg decorating kit/dye of choiceSmall pieces of colored and clear cellophaneBake . . .
Brighten up a sunny summer day (or a Cinco de Mayo celebration) with colorful smiling suns!Supplies Paper plate (white or colored;small or large) Scraps of yarn White glue Pencil Scissors Bu . . . Celebrating Cinco De Mayo at home? Make a festive decoration with this quick and easy DIY project.Supplies 6 sheets of tissue paper (10” x 20”)Several sheets of black paper or cardstockRoll of c . . .
Make a Super Mom badge for mom this Mother's Day! SuppliesCupcake linersScraps of paper and/or old book pagesCrepe paper or ribbonsAlphabet stickers or stampsScissors (plain or decorative)Cookie cu . . .
Show mom how much she is appreciated this Mother’s Day with a decorated mason jar full of love! Supplies Empty mason jar with lid Scraps of colored/patterned paper Pieces of ribbon or strin . . .
What Mom wouldn’t like to receive this pretty mosaic for Mother’s Day? It’s fun and easy to make with just a few basic craft items and a little creativity! Supplies: Blank greeting card or sh . . .